A strong frontal boundary will begin to eject itself Northeast out of Texas beginning today, and that will bring severe weather to millions across the Southeast over the next two days. As this front ejects, a dangerous day develops today across portions of Eastern Texas, Louisiana, Arkansas, & Mississippi. Large tornados could be possible with models hinting at Severe Tornado Perimeters(STP) topping 7 in the area. STP is a measure of the amount of rotation available as a parcel of air is lifted, combined with how much fuel is present in the atmosphere as the parcel is lifted. Tomorrow this same system will push over the mountains of WNC, and the STP’s will be in the 3-4 range. This is a very high reading compared to what most storms bring to WNC. So, below ill discuss the details regarding the system, but know that a dangerous severe threat will be possible around WNC tomorrow afternoon, and a chance for a tornado cannot be ruled out. 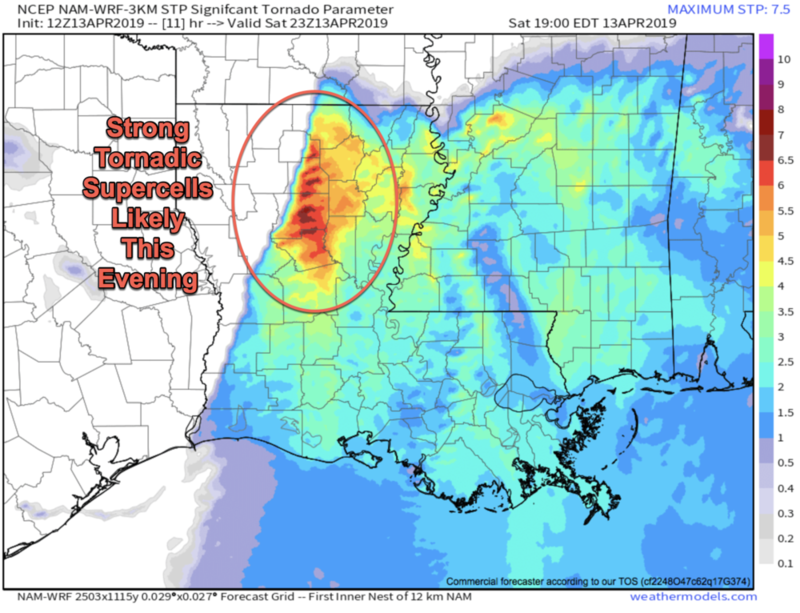 Models continue to elude to a juiced environment ahead of this ejecting low pressure, and as you can see below, Severe Tornado Perimeters will almost be off the charts this afternoon around portions of Northern LA. In the weather community, we refer to this sort of anomaly as a “sting of pearls”. Meaning that there will be several congruent supercells moving across the land in unison, without impeding the others updrafts. It takes extreme veering or turning of winds with height to accomplish this, but fronts in the US have the capability. I expect later this evening to be tracking several tornado across portions of Northern Louisiana & Southern Arkansas. This same system will then take aim at WNC. Scattered showers will be likely throughout the day tomorrow, but then some slight clearing and peaks of sun will really destabilize the atmosphere ahead of the frontal passage. 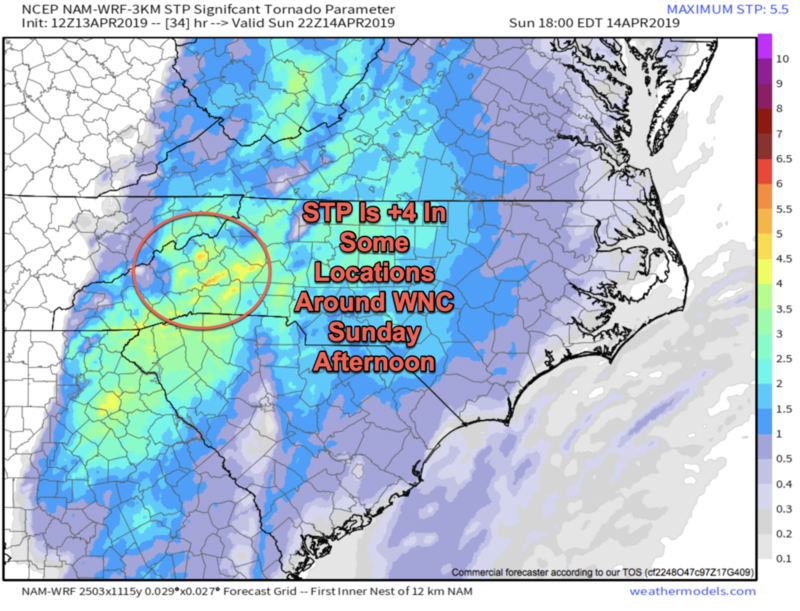 Below you can see the most recent NAM 3km data showing the STP around WNC tomorrow afternoon. Notice how many locations show reading of +4! Those are some of the higher STP’s that I have even seen projected for WNC. Here is the projected radar from the most recent 3km NAM as well. The veering or turning of the winds at the surface is what makes this system so dangerous. Winds will be from the South or Southeast at the surface, but aloft they will turn more Westerly. Like a spinning top, this veering generates tornadogenises and with adequate dew points, a funnel reaches the surface. Below is a sounding of the atmosphere from tomorrow as the most active weather moves in. Need A Trusted Local Tax Pro? This change in wind direction with height will create for a dangerous weather day around WNC tomorrow. Strong winds, hail, lightning, and even an isolated tornado cannot be ruled out. If you recall the other day I showed a similar sounding from the Upstate of SC. That corresponded with isolated hail, and strong winds. This could be very similar around WNC if this sounding is to be taken serious. I will be live later today (1pm), and then tomorrow keeping you updated regarding the progression of severe weather, and ill also be doing a bit of chasing if necessary to ensure that eyes are on the sky. You can also use the WNC Weather Cameras to watch storms move across the area! I am continuing to watch the backside of this system as models have shown the possibility for Northwest Flow snow showers to move in early Monday. Winds will get up as the front passes, and these flurries cannot be ruled out reaching Downtown Asheville. No accumulation is expected except for locations above 4500’. So a very dynamic system is on tap for WNC over this weekend, and you shouldn’t let your guard down! I’ll be live later this afternoon around 1pm so be sure to tune in!